Lacy, light, and airy. Annamaria is a very pretty faux linen sheer adorned with macrame lace and embroidery. Tailored Panels are offered in 63" and 84" lengths. Panels are 55" wide and sold separately. Features a 1 1/2" rod pocket, 1 1/2" header, 1/2" side hems, 5 1/2" Macrame middle insert, and 6" Macrame bottom. 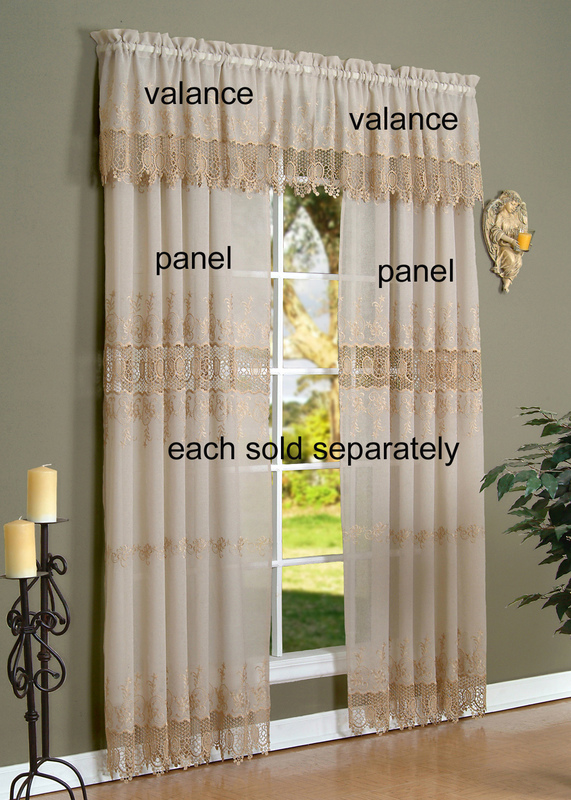 The Tailored Valance also features 1 1/2" rod pocket, 1 1/2" header, 1/2" side hems, and 6" Macrame bottom. Made of 100% Polyester and washable. Choose White or Mushroom. Dimensions: 55"W x 84"L Photo shows two panels and two valances. Each panel is sold separately, each valance is sold separately. Lacy, light, and airy. Annamaria is a very pretty faux linen sheer adorned with macrame lace and embroidery. Panel is 55" wide and sold separately, one panel per package. Features a 1 1/2" rod pocket, 1 1/2" header, 1/2" side hems, 5 1/2" Macrame middle insert, and 6" Macrame bottom. 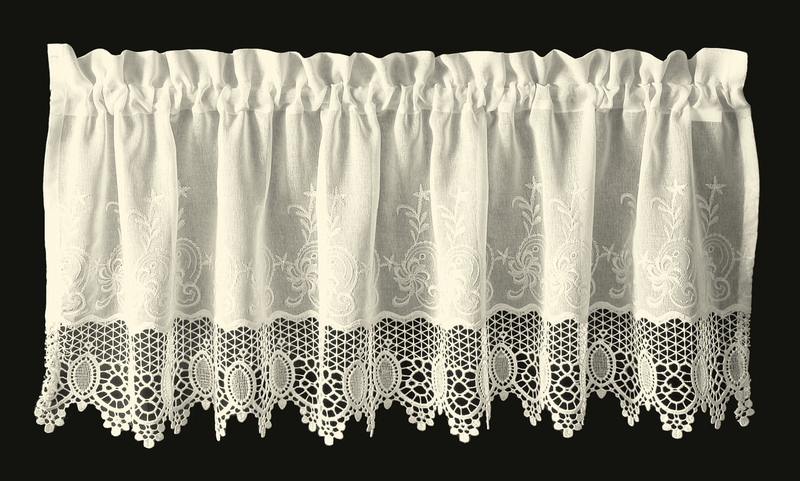 The Tailored Valance also features 1 1/2" rod pocket, 1 1/2" header, 1/2" side hems, and 6" Macrame bottom. Colors: Off White or Mushroom. Panels sold separately, one panel per package. Beautiful Sheer Curtain panel featuring a Macrame embellishment. Tailored Panels are offered in 63" and 63" lengths. Panels are 55" wide and sold separately. Features a 1 1/2" rod pocket, 1 1/2" header, 1/2" side hems, 5 1/2" Macrame middle insert, and 6" Macrame bottom. Made of 100% Polyester and washable. Choose White or Mushroom. Tailored Panels are offered in 63" and 84" lengths. Panels are 55" wide and sold separately. Features a 1 1/2" rod pocket, 1 1/2" header, 1/2" side hems, 5 1/2" Macrame middle insert, and 6" Macrame bottom.